If you want to make progress and create success, sometimes it's smartest to study what NOT to do, so you can be aware of what's been causing you your frustrations. In this series, I am going to be walking you through the mindset of the weak and the average, and what keeps them there. If you hope to separate yourself from the masses, you have to think different. So the challenge for you is this: do you have the courage to find out what these mindsets and attitudes are, and then have the courage to admit you have been weak and need to change? Check out episode 1, where I break down the first deadly mindset….the “goal setting” mindset. There's a lot of these types running around Instagram. Take a listen. (8:56) What are the mindsets that are keeping you average, inconsistent, anxious, worried, etc. (13:58) Don’t set goals without purpose. (17:00) Can you relate to this mindset? 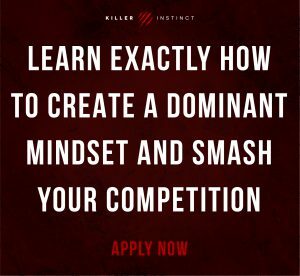 It is my purpose and mission to show you how to become a fearless, dominant and supremely confident competitor.